A pair of green fisherman's braces with flies including western blackghost, daves hopper, bucktail caddis and more. A great country sports accessory. Fishing Fly Tie Green. 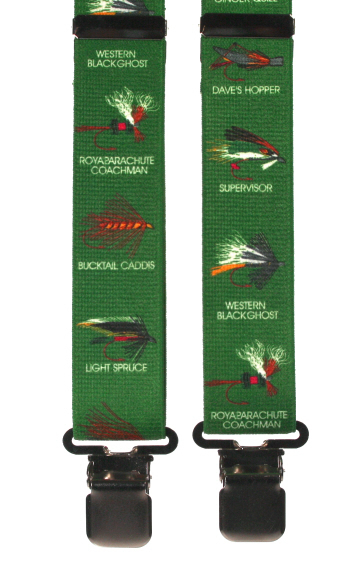 A variety of colourful fishing flies on a plain olive green neck tie. Available in three colours. Silk Fly Fishing Tie . A striking coloured fishing fly on a plain navy blue neck tie. One of our Premier Collection Silk Ties.